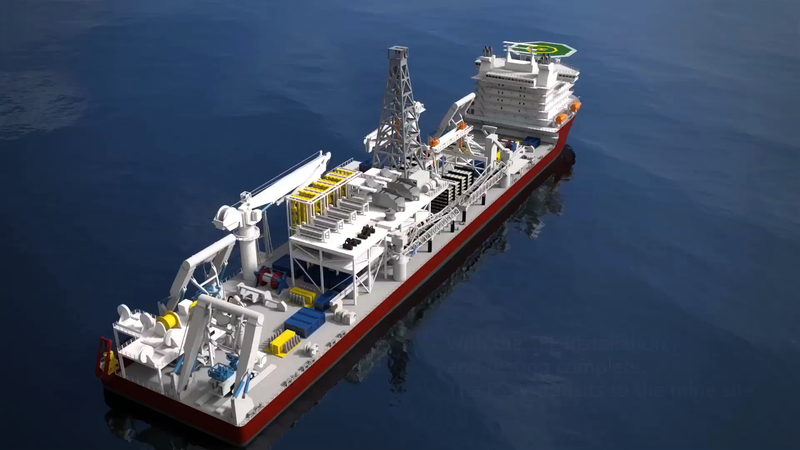 MacGregor, part of Cargotec, has been awarded a contract by Fujian Mawei Shipbuilding Limited for two subsea knuckle boom cranes to be installed on the world's first seabed mining vessel. Delivery of the cranes is scheduled for Q1/2017. The order was booked into first quarter 2015 order intake. The 227m production support vessel has a beam of 40m. It has been designed by Singapore's SeaTech Solutions for Dubai-based owner Marine Assets Corporation (MAC). Following delivery at the end of 2017, it will operate under long-term charter to Canadian seafloor exploration company Nautilus Minerals Inc. The MacGregor order consists of two knuckle boom cranes; a 200t active heave-compensation (AHC) subsea crane with the capability to operate to a depth of 2,500m, and a smaller 100t subsea crane. Mike Johnston, CEO of Nautilus Minerals, says, "We are very pleased to have such a world class supplier providing key equipment for use on our Production Support Vessel. The cranes are an essential component in ensuring operations can be performed safely across all of our large working deck areas. We look forward to reporting on the progress of this equipment as we move closer to production in 2018." "We are delighted that we have been chosen to supply the cranes for this exciting and prestigious new vessel," says Tom Svennevig, Vice President, Offshore Load Handling, MacGregor. "The demands of offshore operations are constantly changing. At MacGregor, we work hard to understand our customers' requirements and to ensure that we are always ahead of the competition in our ability to offer exactly the right hardware for the job, supported by our global service infrastructure."